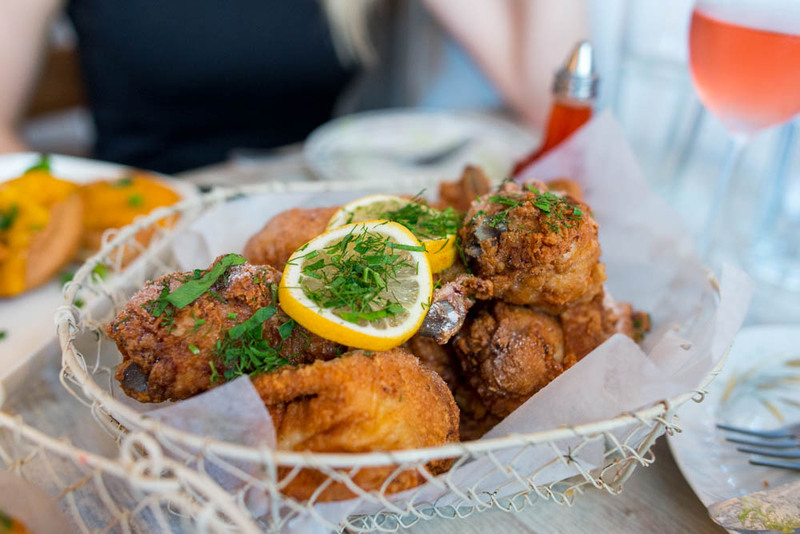 Fried chicken is one of those foods that somehow universally unites even the pickiest diners (minus the vegetarians and vegans of course). I mean how can you even pretend to not like a hot plate of juicy fried chicken, golden and crunchy? Within the span of a few months quite a few contenders popped up all over town, attempting to win over the hard to please New Yorkers with their take on the perennial favorite (of mine at the very least). I was more than happy to do a bit of sampling to figure out which one will satisfy my never ending hunger for fried chicken. 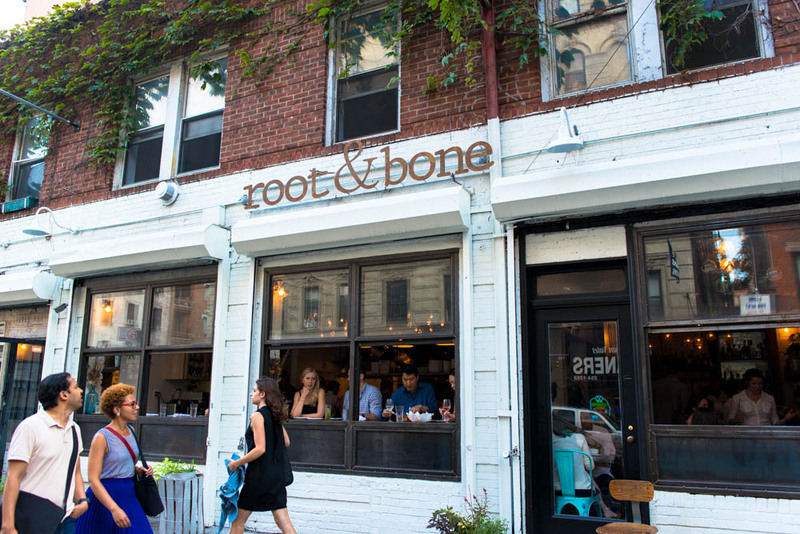 First up was Root & Bone in East Village. 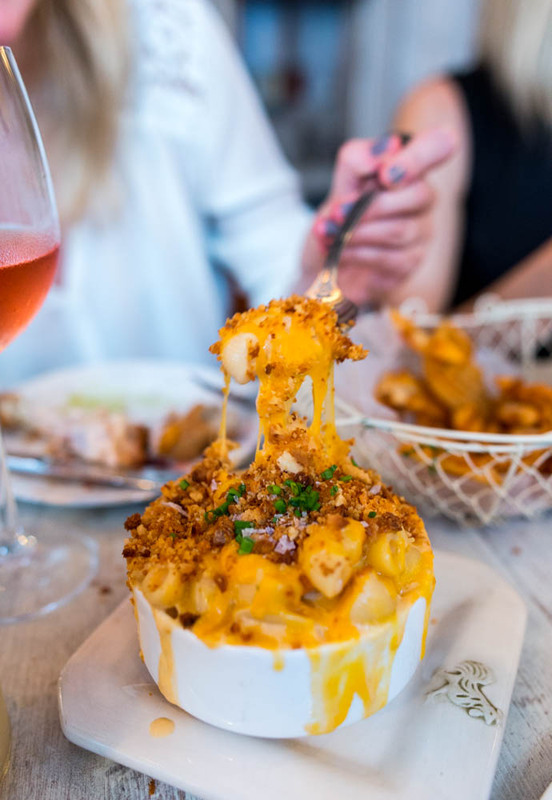 Located all the way on Avenue B, this wasn’t easy to trek to but I somehow managed to convince 3 girlfriends to venture eastward with me to check out this new spot opened by two Top Chef alums. See what I mean about the allure of fried chicken? We dashed across and down town to make sure that we arrived at the restaurant before the crowd did for dinner Friday afternoon late summer. We were lucky and managed to sweep right in and snag one of the last remaining four tops. Decorated with quaint knick knacks, the farm inspired tiny Southern spot won me over immediately before we even had a single bite with its mismatched floral china and twinkling lights. 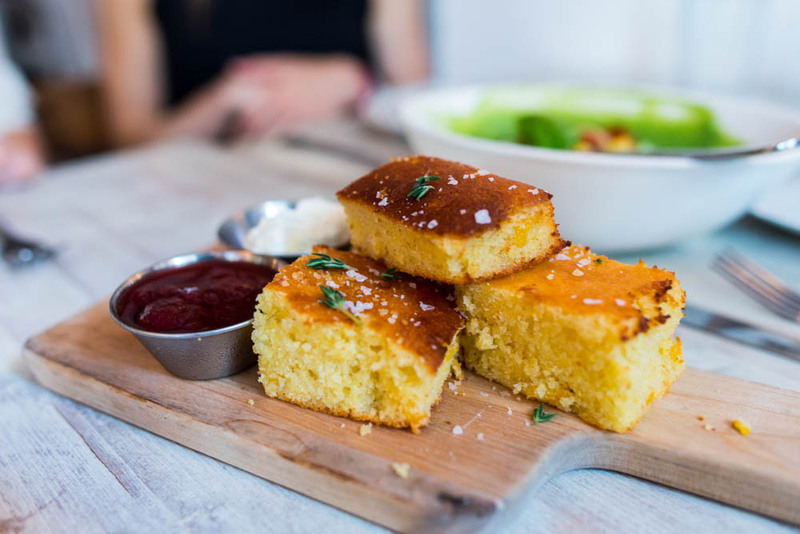 Our dinner started of with a side of Southern style corn bread serve with a side of clotted cream and homemade preserve. The corn studded fluffy bread really needed no accompaniment but it was darn hard to say no to clotted cream. 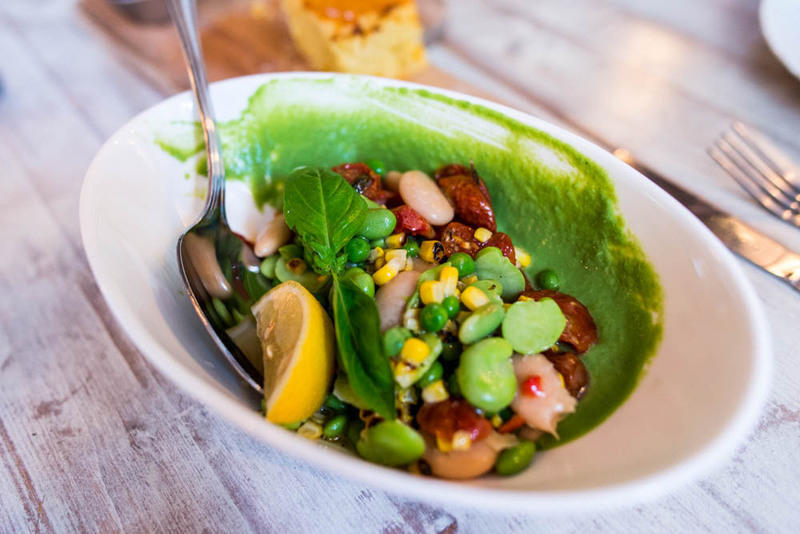 A bright medley of vegetables of creamy butter beans, fava beans, peas, charred corn and roasted tomatoes made the normally bland and boring succhotash almost unrecognizable in an amazing way. This might make even those who usually turn their noses up at eating their vegetables change their mind. 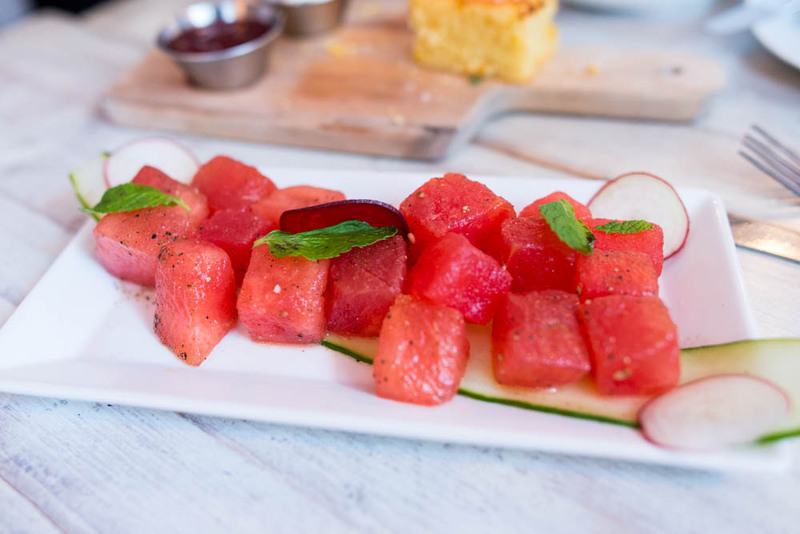 Perhaps another seasonal special like the succatosh, the chilled watermelon salad with mint and lemonade vinaigrette was refreshing side dish to the upcoming dinner of fried chicken. And now onto the main event, the fried chicken. What made the chicken at Root & Bone memorable was the brine of sweet tea that the chicken is marinated before hitting the pressure fryer to impart an unique flavor to the meat and kept it moist to the last bite. 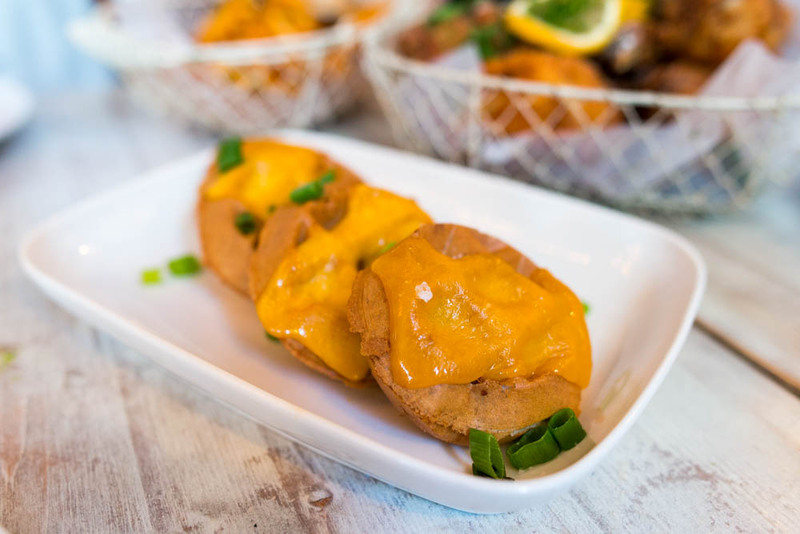 The chicken here can be ordered half or whole, with or without a side of buckwheat waffles and cheddar whiskey syrup. For me this was a silly question, there was no option of fried chicken without waffles. Of course get the waffles! Enjoyed separately or pulled apart to make a mini chicken sandwich, these were a great choice either way. 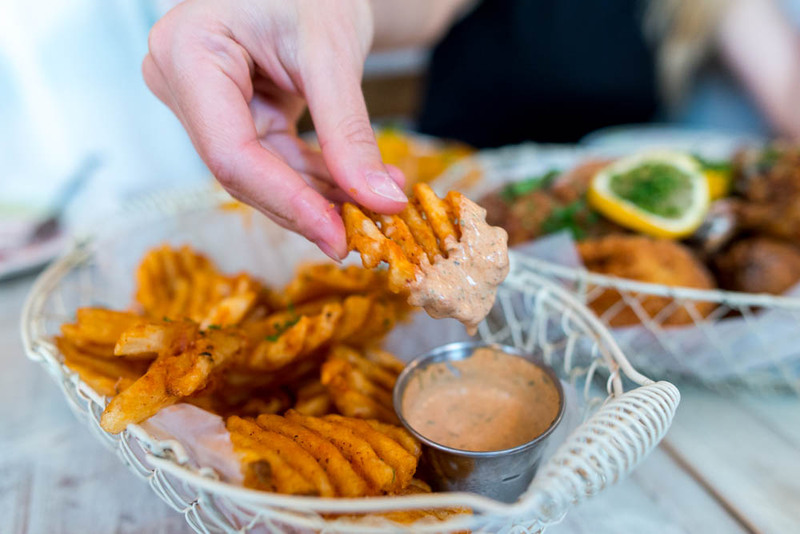 And of course, the second I laid eyes on the waffle fries with dill pickle salt and chunky remoulade on the menu, I knew I had to have them. Why not more restaurant offer these on the menu is a mystery to me because there is nothing that makes me happier than these rather unnaturally shaped fried potatoes. 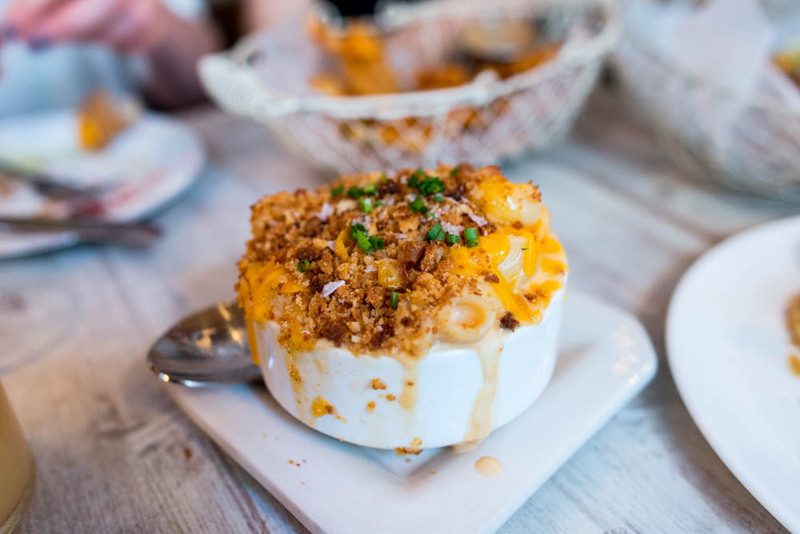 A side of mac n cheese here came with an incredibly crunchy biscuit thyme topping and the heaping of cheddar on top made pulling away that first bite extra special. 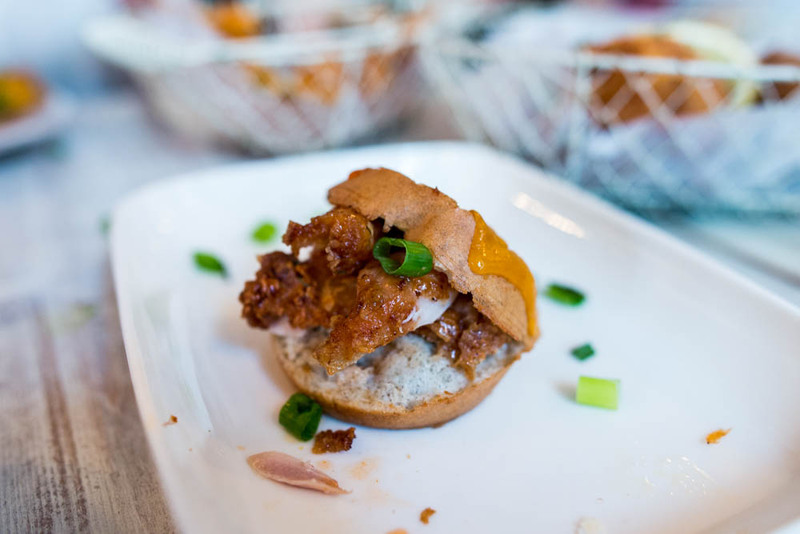 Root & Bones offers other dishes than just fried chicken for those who might want something a little more refined. 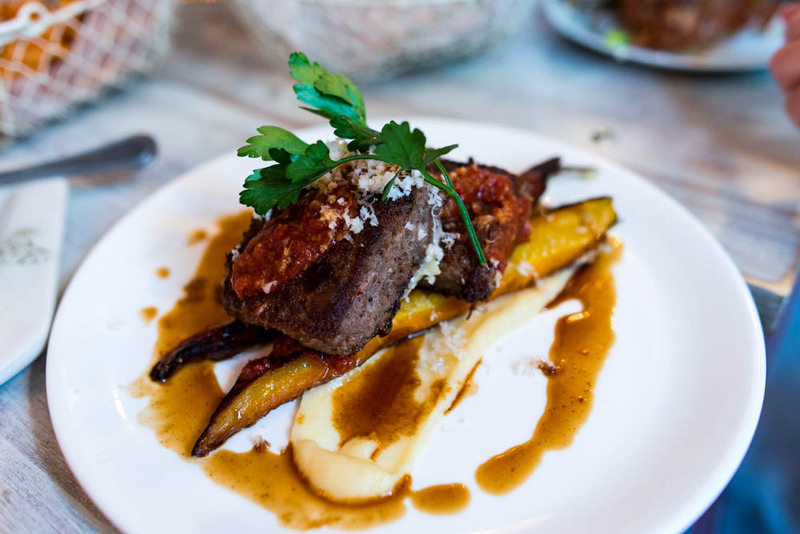 The braised short rib meatloaf with parsnip mash and tomato ketchup jam and horseradish was more than just your typical weekday night dinner. Instead of a typical meatloaf, the ones here were made up of shredded tender short ribs and baked until each square had a light crust. We polished off nearly everything we ordered for dinner leaving behind just one small piece of chicken and a few bites of the meatloaf. My craving for fried chicken was happily satisfied by Root & Bone’s sweet tea brined lemony version that was juicy and crisp. 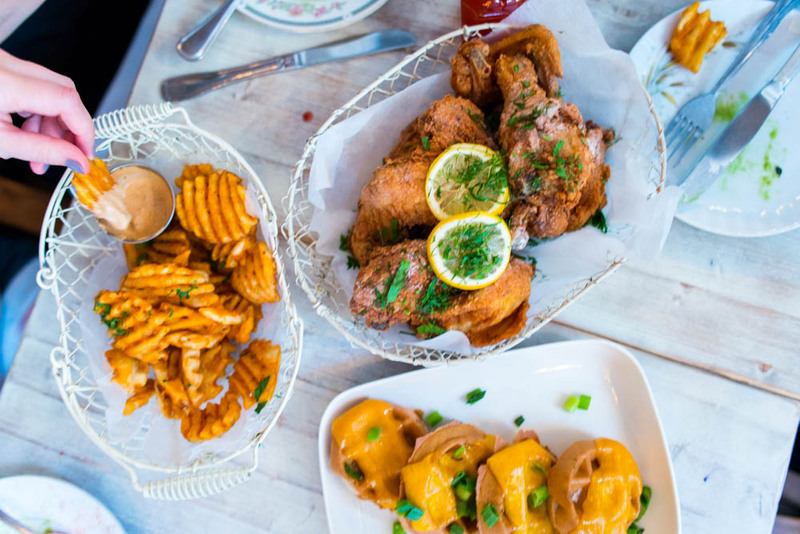 The Southern take was flavorful success in my mind and set a happy tone for my journey to try the other newly launched fried chicken spots vying for our attention.